Originally best known for its wool shedding, low maintenance features with lower costs, less handling, less labour and less chemical use. 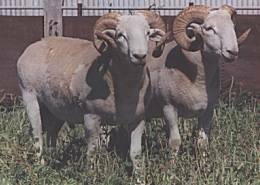 More recently the breed’s qualities of lean meat, good muscling, big frame, high fertility, good maternal behaviour and hardiness have become highly valued in the production of prime lambs. We don’t shear, crutch or mules our sheep. They are more like running small cattle than sheep. Fly problems are virtually nil. Over the past 9 years we have only assisted one birth and that was not necessary. The ewes are terrific mothers consistently having twins and triplets. One of our ewes raised quads unassisted. They have lots of milk and are very protective. Our average lambing percentage is 125%. Flocks in other areas where there are fewer predators have 160% - 180%. Now that we are using Alpacas to protect our sheep we are expecting even higher percentages. Their grazing habits are different. They tend to spread out across the paddocks in small groups. This has reduced the amount of erosion on our farm during the summer months. They seem to like rougher plants in our pastures. This has left our medic clovers to establish better. Throughout the dry years of 2002/2003 we have not hand fed the sheep. They seem to graze plants that other sheep won’t eat. 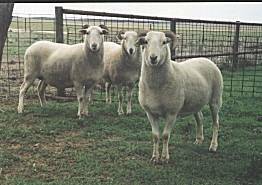 I think they are the drought masters of sheep breeds, performing well in all climatic conditions. Our decision to run Wiltshire Horn Sheep has been one of the best things we have done on our farm. I doubt if there is a hardier breed of sheep.